Neil Gaiman has said that a planned film adaptation of his Sandman comic will be "a Vertigo film" and "not a DC Comics film." Last December it was revealed that Joseph Gordon-Levitt and screenplay writer David Goyer were working with Neil Gaiman to bring an adaptation of his famous Sandman comic series to the silver screen. You can perhaps imagine, in turn, why some were a bit perturbed when DC and Warner Brothers announced a slew of new comic based movies last week but failed to deliver any news about Sandman. According to Gaiman however, fans looking forward to a Sandman flick have no reason to worry just yet. That, at least, is what we're taking from the writer's response to a reader question posted on his Tumblr last week. 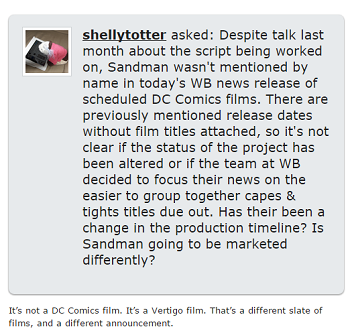 Said reader asked about the DC films announcement, inquiring as to why Sandman wasn't included and if it would "be marketed differently." Gaiman's response was equal parts short and interesting. "It's not a DC Comics film," he said. "It's a Vertigo film. That's a different slate of films, and a different announcement." While, of course, this is no way a confirmation of anything, Gaiman's reply would seem to indicate that if Sandman does wind up making it to theaters that it will be doing so under the label of the Vertigo label. Vertigo, of course, is a separate comic line owned by DC but not generally connected to the primary DC Universe. If Sandman were to launch under a Vertigo Films branding, it could easily serve as the launching point for a third player to enter the business of comic book movies. The big question that emerges from this though, is why DC and Warner Brothers would hesitate to reveal this if it's real. We've reached out to the two to see if we can find out anything more.